The Under 19 Schools cricket season for 2014/2015 got off in early September with third term fixtures and there will be a one month break for Christmas in December. The first term matches are expected to commence by early January’2015 provided there won’t be any interruptions with the country’s Presidential Election. The season had its share of interruptions so far with inclement weather spoiling most of the matches and teams may struggle to complete their quota before 1st term begins. There were many wash outs with some being called off without a single ball being bowled. In a nutshell among the teams competing in the tournament organized by the Sri Lanka Schools Cricket Association (SLSCA), Lumbini MV heads the win tally by enjoying five outright wins from seven matches they played. Next best would be St. Thomas’ with three wins followed by Trinity, Thurstan and St. Benedict’s who enjoyed two wins each. Meanwhile on other matches being played so far, St. Joseph’s College managed to record an innings and 77 runs win over Maris Stella College, Negombo and Josephians can count themselves hard-done as when they were chasing 22 runs to win in 03 overs against Mahinda College at Darley Road, umpires called off the game due to bad light when St. Joseph’s were well placed 16/1 in 2 overs. St. Joseph’s had to content with a 1st innings win. However Josephians lost on 1st innings to D.S.Senanayake College and Thurstan College earlier in the season and their matches against St. Aloysius College and Nalanda College were called off without any results due to bad weather. Meanwhile St. Peter’s could record only a 1st innings win over De Mazenod College, Kandana while they lost on 1st innings to Isipathana College. Their match against Trinity College was called off without a single ball being bowled and matches against Joseph Vaz College and St. Aloysius College were called off with no results due to bad weather. In this edition, we are reviewing two Schools Cricket Teams who can boast of a rich Cricketing legacy of a century or more and looking at their squads and the plans ahead with some key games ahead. They have produced Champion teams and some fine cricketers in the past but over the years St. Benedict’s has lacked in consistency and has more often played below their true potential. This year as the College gears up to celebrate 150 years their cricketers are more determined than ever to make their effort count. 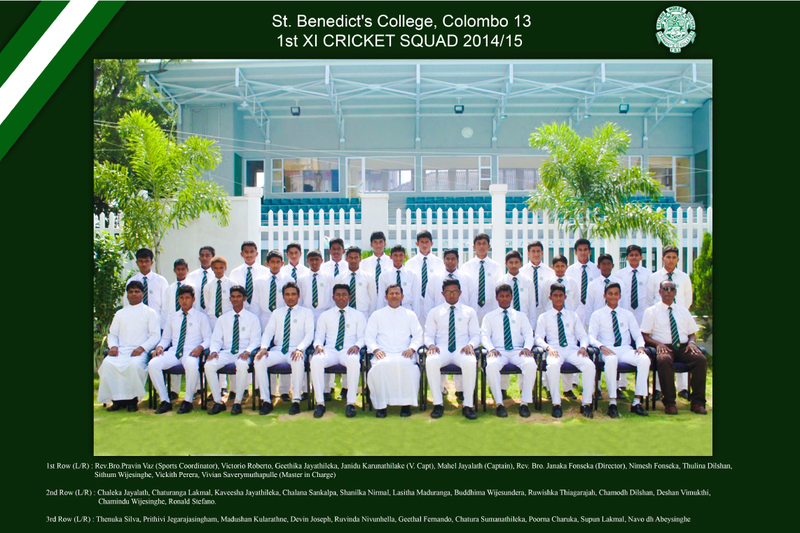 Led by third year coloursman Mahel Jayalath the Benedictines have set their sights not only to be unbeaten but to finish on top of the Sri Lanka Schools Cricket Tournament. There is much vigour, zeal and determination all over the face of the young Benedictine Cricketers. They know that this team will go down in the annals of the College history and their goal is to ensure that this year the Cricketers will also be a part of that history. It’s not only the cricketers but the College Cricket Wing which is made up of a few past cricketers, are also driving the push and supporting the boys with all necessary infrastructure facilities. The Unique feature of the Benedictines this year has been the experience and the variety in their squad. They have managed to retain seven players from last year’s unbeaten side and tend to have the variety in plenty giving them an opportunity to face any opposition team with confidence. Skipper Mahel Jayalath, a stylish left hand batsman opens the batting with Thulina Dilshan followed by Roberto Vittori and wicket keeper batsman Janidu Karunathilake. Janidu who had the honour of scoring the only Century last year will be closely watched as he is their most dependable batsman. Aggressive middle order batsman Nimesh Fonseka, Sithum Wijesinghe and Thenuka de Silva completes their formidable batting line up. The fact that the Benedictines have three left handers in their top seven batsmen is bound to be a worrying factor for any opposition. Similar to their batting, the bowling has also a good variety and balance that can rattle even the strongest of opposition. The right arm, left arm opening pair comprising of Chatura Sumanathilake and Geethal Fernando will spearhead the opening attack. This pair is also supported by Sithum Wijesinghe’s right arm medium pace. As in the past the spinners will once again hold the key. Right Arm off spinner Geethika Jayathilake and left arm leg spinner Ruwinda Nivunhella lead the pack followed by Thulina Dilshan (right arm leg spin) and Madushan Kularatne (right arm off spin). Off spinner Jayathilake, the most experienced of the lot finished with 68 wickets last season. Jayathilake and Nivunhella have already proved their mettle by bowling the Benedictines to their first win this season against Wesley. The Kotahena school is once again coached by N I C Silva who has Shashika Maduranga as his Assistant and Vivien Saverimutthupulle as the Prefect of Games. This season so far, St. Benedict’s could complete only three games and they won two convincingly by beating Wesley College and St. Aloysius College, Galle and then Bens won on 1st innings against Anuradhapura Central at Kotahena though match ended in a draw. The matches against St. Servatius College, St. Sylvester’s College and Isipathana College all were called off due to bad weather. 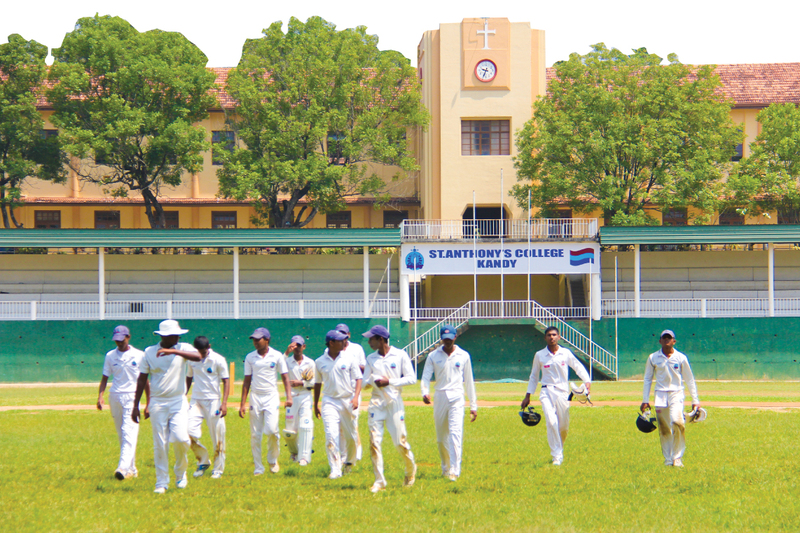 St. Benedict’s College beat St. Aloysius College, Galle by innings and 44 runs in Galle. St. Anthony’s will be competing in the Division 2 of the 2014/2015 Under 19 Schools Cricket tournament with 4th year coloursman Buwaneka Wijetunga leading the Eagles. This is after College from Katugastota failed to live up to their expectations in the 2013/2014 Schools Cricket season where they competed in the Group A and was relegated after a disappointing season. Last season, Antonians could only manage four first innings wins which included wins against top teams in Colombo; Royal College, Ananda College, DS Senanayake College and St. Benedict’s College, Kotahena. Against St. Benedict’s College a long standing traditional fixture played at Kotahena St. Anthony’s scored 184 runs and then bowled out Benedictines for 162 runs with leg-spinner Kavinda Udapola picking up 7 for 51 runs in a stunning spell of bowling. Anthonians conceded five first innings defeats and two outright defeats during that season. The biggest defeat was against St. Joseph’s College another traditional fixture which is played for Murali-Vaas trophy where they faced ignominy of being bowled out for 76 and 96 losing the match by an innings and 35 runs. However they had a silver lining in that disappointed season, when they recorded a first innings win over their arch rivals and fancied Trinity College in the 98th Battle of the Blues in Kandy. This was after 5 years that Antonians managed to record a first innings win over Trinitians. In 2013, it was a team filled with youngsters that competed and this year they have gained that experience and are eager to make amends in ongoing season. This year St. Anthony’s equipped with a strong top and middle order batting line up compared to last year where they heavily relied on their top order to do the bulk of scoring. Top scorer of that season for St. Anthony’s their left-handed opening batsman Kanishka Uggalpaya scored 669 runs and scored the only century of the season for the Hill side, that was 127 against Nalanda College. 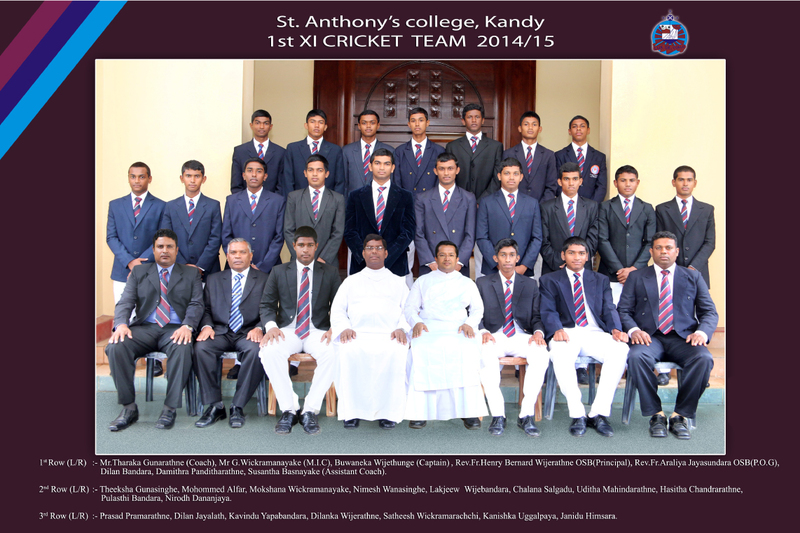 Kansihka is in his 3rd year in 1st XI and he opening the batting once again for Antonians this year. The No.03 in the batting line up will be occupied by that young batting prodigy and wicket keeper Mohamed Alfer who scored 450 runs last season. The 16 year old wicketkeeper batsman is in his 3rd year was in the Sri Lanka Under 17 squad which took on England recently after performing consistently during past two seasons. At No.4 experienced 4th year player Damithra Panditharathne walks out to bat with 513 runs under his belt from 2013/2014 season. Vice Captain of the side an all rounder Dilan Bandara comes in at No. 06. He is in his 5th year and well experienced. He scored 339 runs last season while capturing 29 wickets. The captain, Buwaneka is also an all rounder comes in at No. 07 position. He scored 325 runs and captured 18 wickets last season. He is a left hand batsman and right hand leg spinning bowler and much is expected from him in the bowling this year as Antonians bank on their experienced spin bowling department to come good this season with couple of young fast bowlers forming their opening bowling attack. Speaking to Quadrangle, Antonian skipper Buwaneka had this to say ‘This year we have a well balanced side with good experienced top and middle order and a spin bowling attack backed by a talented junior set of players. Our strength would be the spin bowlers with experienced Uditha Mahindaratne, my deputy Dilan Bandara and together with me will need to do bulk of the bowling. Same time young fast bowling duo Janidu Himsara who was a member of Sri Lanka Under 15 side together with Dilanka Wijeratne who also can played for couple of season will open the bowling attack’. With his side being relegated to Division 02 and to compete against the likes of St. Sebastians (Katuneria), St. John’s (Panadura), St. Annes (Kurunegala) and home town rivals Vidyratha, Kingswood and the big traditional encounters against St. Benedict’s, St. Joseph’s, Wesley and Trinity Buwaneka was optimistic with their chances and had this to say ‘Our aim is to gain a promotion to Division 01 and also to play well against in traditional fixtures, especially to win the 99th Encounter against Trinity. We were hampered last year with lack of experience. However we have 06 to 07 experienced players and we gained lot of exposure last year though we were demoted. We will use that experience and the determination to bounce back this year and we want to end up among the top as one of the best teams’. Talking of their preparations and support they are getting he was full of praise for the coach Old Antonian Tharaka Gunaratne, assistant coach and supporting staff, College Principal and the Old Antonian Cricket Wing for all the support given and for the encouragements. ‘We’ve been training hard for some time and we got all the support. Now it’s up to us to perform and make ourselves and College proud. We are doing that and we wish to thank all who support and follow us. We want them to continue to support and believe in us’ said Buwaneka in his closing remarks. Antonians are coached by Tharaka Gunaratne and they are getting the fullest support from the Old Antonian Cricket Wing headed by Piyal Wijetunga with the backing of College Old Boys Association headed by Senaka Rajapakse. Antonians opened the 2014/2015 season against St. Thomas’ College at Mt. Lavinia in their traditional encounter after their two friendlies against Wesley College and St. Anne’s College were washed off and being postponed. Against St. Thomas’, Antonians had their first match blues and crumbled to a 7 wicket loss. The Antonians showed improvements in their batting department when they hosted Wesley College at Katugastota after the game was rescheduled. However this game too was not spared by the weather as the match was curtailed due to rains and only 65.2 overs were bowled during both days of play. St. Anthony’s after winning the toss, put up 228 runs on board in 45 overs with skipper Buwaneka Wijethunga top scoring with a well compiled 71 runs followed by Pulasthi Bandara with 33 runs. Wesley could muster only 53 runs for the loss of 3 wickets in 19.2 overs before rains halted play. The game against Kingswood was postponed due to bad weather and Antonians managed to salvage some pride and play some cricket too when they hosted Vidyratha College and won the match convincingly. Dilan Bandara grabbed a match bag of 12 wickets for 53 runs for Antonians.